Chicken raw meat and skin: Chicken raw meat and skin is high niacin. On the other hand. is low in carbohydrate, total dietary fiber and total sugars. Batter fried chicken: This food has a low quantiti of total dietary fiber, total sugars and calcium but has a high quantity of protein and niacin. Flour fried chicken: High in protein, niacin and choline, total and low in carbohydrate, total dietary fiber and total sugars. Roasted chicken: Roasted chicken is high protein and niacin. On the other hand. is low in carbohydrate, total dietary fiber and total sugars. Stewed chicken: This food is low in carbohydrate, total dietary fiber and total sugars but Stewed chicken has protein and niacin in high quantity. Fried chicken : High in protein, niacin and vitamin b6 and low in carbohydrate, total dietary fiber and total sugars. Roasted chicken meat: Roasted chicken meat is high protein, niacin and vitamin b6. On the other hand. is low in carbohydrate, total dietary fiber and total sugars. Stewed chicken meat: This food is low in carbohydrate, total dietary fiber and total sugars but Stewed chicken meat has protein and niacin in high quantity. Raw chicken skin only: This food has a low quantiti of ash, carbohydrate and total dietary fiber but has a high quantity of total lipid, saturated fatty acid and monounsaturated fatty acids. 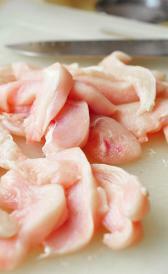 Raw chicken giblets: High in iron, zinc and selenium and low in carbohydrate, total dietary fiber and total sugars. 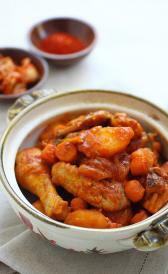 Stewed chicken light meat: Stewed chicken light meat is high protein and niacin. On the other hand. is low in carbohydrate, total dietary fiber and total sugars. Roasted chicken dark meat: Roasted chicken dark meat is high protein and niacin. On the other hand. is low in carbohydrate, total dietary fiber and total sugars. Stewed chicken dark meat: This food is low in carbohydrate, total dietary fiber and total sugars but Stewed chicken dark meat has protein in high quantity. Fried chicken light meat: High in protein, niacin and vitamin b6 and low in carbohydrate, total dietary fiber and total sugars. Fried chicken dark meat: High in protein, zinc and niacin and low in carbohydrate, total dietary fiber and total sugars. Stewed chicken dark meat: This food is low in carbohydrate, total dietary fiber and total sugars but Stewed chicken dark meat has protein and zinc in high quantity. Raw chicken fat: This food has a low quantiti of ash, carbohydrate and total dietary fiber but has a high quantity of food energy, total lipid and saturated fatty acid. Batter fried chicken back : Batter fried chicken back is high protein, total lipid and selenium. On the other hand. is low in total dietary fiber, total sugars and manganese. Flour fried chicken back: This food is low in total dietary fiber, total sugars and manganese but Flour fried chicken back has protein, niacin and polyunsaturated fatty acids in high quantity. Roasted chicken back: This food has a low quantiti of carbohydrate, total dietary fiber and total sugars but has a high quantity of protein, total lipid and niacin. Stewed chicken back: High in protein and low in carbohydrate, total dietary fiber and total sugars. Fried chicken back: This food is low in total dietary fiber, total sugars and manganese but Fried chicken back has protein, zinc and niacin in high quantity. Roasted chicken back: This food has a low quantiti of carbohydrate, total dietary fiber and total sugars but has a high quantity of protein, zinc and niacin. Roasted chicken breast: High in protein, niacin and vitamin b6 and low in carbohydrate, total dietary fiber and total sugars. Stewed chicken breast: Stewed chicken breast is high protein and niacin. On the other hand. is low in carbohydrate, total dietary fiber and total sugars. Fried chicken breast: This food has a low quantiti of carbohydrate, total dietary fiber and total sugars but has a high quantity of protein, niacin and vitamin b6. Roasted chicken breast: High in protein, selenium and niacin and low in carbohydrate, total dietary fiber and total sugars. 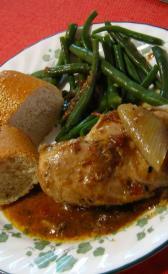 Stewed chicken breast: Stewed chicken breast is high protein, niacin and choline, total. On the other hand. is low in carbohydrate, total dietary fiber and total sugars. Roasted chicken drumstick: Roasted chicken drumstick is high protein and niacin. On the other hand. is low in carbohydrate, total dietary fiber and total sugars.